It is southern spring again, and once again we are taking images of our favorite locations. We return to the same sites so that we can study processes from year-to-year. Do spring processes always play out similarly? Or do the occasional dust storms affect when fans appear and the pace of seasonal activities? This location is known informally as Inca City. As citizens of Planet Four you already know that a seasonal polar cap composed of CO2 ice (dry ice) forms every winter. In the spring the ice sublimates from the top and the bottom of this layer of ice, and under the ice the trapped gas builds up pressure. Eventually a weak spot in the ice ruptures, and the gas escapes, carrying material from the surface with it. The material is deposited on the top surface of the ice, forming the fans and blotches that you have been measuring. Inca City has distinctive ridges, one of which is shown at the top of this series of cutouts. The first cutout on the left was the first image to be taken after the sun rose, marking the end to polar night. We label time on Mars by “Ls”, which indicates the position of Mars in its orbit. Spring officially starts on Ls = 180, so at Ls = 174 there is very little sunlight. In spite of the small amount of sunlight seasonal activity has already started, and fans can be seen emerging from “spiders”, known formally as “araneiforms”. These images have not been map-projected yet, so use the black arrow pointing at one of the spiders to orient the same locations from image to image. In the second image from the left, taken about 2 weeks later, you can see that the fan from that spider has become more prominent. In the araneiforms above so much dust has blown out that the individual fans seen in the leftmost image have begun to merge. The ridge is peppered with small spots where the seasonal ice has ruptured (blue arrow). Near the bottom of the second image there are new fans associated with boulders. Below that, at the bottom of the image, four new rupture sites have fans going in multiple directions. The differences between the second and third images from the left are not substantial. That is because the time difference between the two is just 6 days, or “sols”. Fans on the ridge have lengthened just a bit, possibly due to fine material sliding downslope. 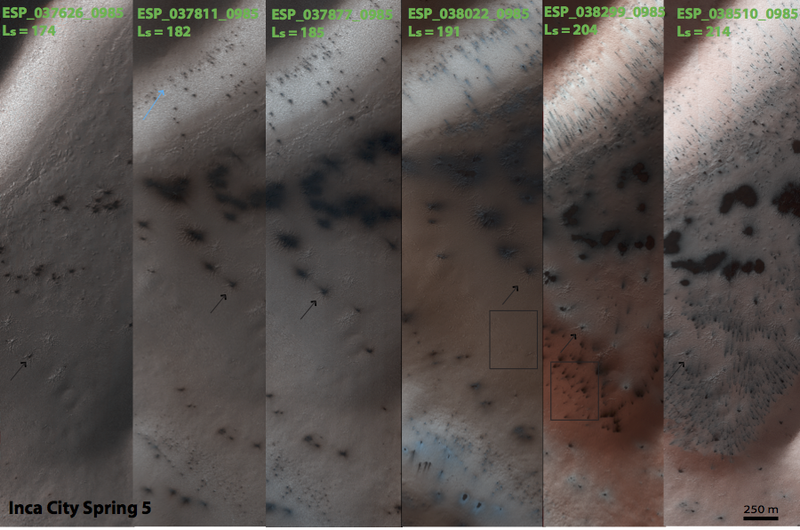 In the fourth image from the left, taken at Ls = 191, the fans covering the araneiforms and on the ridge slope appear grey – are fine particles sinking into the ice? At the bottom of the image distinctive bright bluish fans are apparent. Look at the boxed area in the 5th image and compare it to that same area in the 4th image, just below the indicated spider. The bland surface in the 4th image is now cracked. Polygonal cracks typically occur at this time in the spring. There are no easily-ruptured weak spots, so the pressure of the gas below the ice simply cracks the large plate of ice. The ice must have thinned to the point at which this pressure can break the ice sheet. Once it has cracked the gas escapes and new fans emerge, aligned along the cracks. The ice has continued to thin by the time of the 6th image, and the araneiforms have likely defrosted entirely. More small fans emerge from cracks in the ice.